Composite Rockdoors are regarded in the industry as the best composite door on the market in terms of quality and security and being the focal point of your property your door should look superb while also being sturdy and secure. With a beautifully designed Rockdoor you won't give it a second thought. Half measures wont do when it comes to the security of your property and A6 Windows certainly dont take any short cuts your Rockdoor comes CE marked to comply with european policies. Get peace of mind with a ten year guarantee on a composite door which is built to last unlike many cheap composite doors . With a huge range of beautiful designs and colours to choose from including white ,mahogany ,rosewood,golden oak black ,blue, green, red, grey with single or double doors. The realistic wood grain surface makes it look and feel as stylish as a traditional wood door, with high "kerb appeal" unlike a upvc panel door. It's ultra robust, resists scratching and is easy to clean. A multi point locking system engages into stainless steel keeps which run the whole length of the frame. Front doors can feature special glass designs giving an extra special touch. Rock door upvc front doors and Back doors can also be specified with different locking systems - your Rockdoor cannot be forcibly levered opened and anti-drill plates prevent locks being drilled giving highest security available so strong that even the Police couldn't break in! Rockdoors are designed to be one of the most secure doors on the market. Achieving PAS 23 & 24 and equal to secure by design ensuring you have high security doors, Rock door ensures that your safety and high security are our number 1 priority. There are also Rockdoor options for the back door of your home, where most break-ins occur. 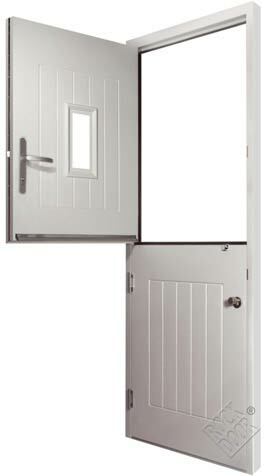 Our stable door gives a unique blend of high security and performance - allowing you to open the top only keeping young children and pets secure whilst permitting fresh air into the house.